Click Here to see just some of Our Inventory! 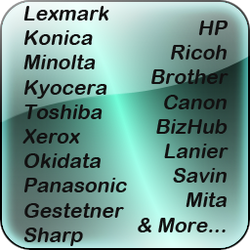 Toner Technologies is able to offer our customers many choices in Copiers, Printers, Scanners & Fax machines, both New & Certified Pre-Owned, from the industry's most reputable companies like LEXMARK, KONICA MINOLTA, CANON, KYOCERA & more. We can help you evaluate available products & select those machines that best meet your current & projected printing & copying needs. We have many inexpensive lease options available on copiers as well. Let us help you find the perfect Copier! New & Compatible Copier & Printer Toner Cartridges! We have a complete Copier & Printer Service Center in Palm Beach County, Florida and we offer Repair & Maintenance services on most Copiers & Printer models. Our experienced & trained representatives take pride in providing traditional personal service and we have knowledgeable technicians on hand to help get your machine up and running quickly. We also stock most of the replacement parts to expedite repair time. We attempt to pre-diagnose the problem via the telephone, so that the Service technicians time is limited & the correct parts are brought to the service call - which significantly decreases the cost of the repair. Call us today to see why we are the best at what we do! !